As someone who has spent most of her adult life either baking, eating, or selling decadent desserts, I’ve come to accept that I am (and always will be) an ardent dessert fiend. If it’s sweet, or if it’s a baked good, I love it—no background check required. So, you can imagine my dismay when I was first diagnosed with candida (systemic yeast overgrowth) several years ago and told I’d have to give up all sugars and grains, at least for a while. Those are the two main ingredients in almost every conventional baked good! But ditching them both is an essential step to getting the candida under control and restoring good health. For me, eliminating all grains felt doubly restrictive, since I follow a plant-based diet and grains are one of my staple foods. And because a major protein source for me, beans, also contains carbs, it was important to reduce grains to establish and maintain a healthy balance that didn’t feed the yeast. Rather than subsist on salads, soaked nuts and hummus, I decided that I had to learn to create baked goods—even desserts—without any grains at all. Yes, you can have delicious treats that don’t contain sugar or grain products. I’ve made biscuits, cookies, bread, pizza dough and more, all with great success. So how can you cut out grains without losing all your favorite foods? It’s easier than you think, even on a vegan diet. They’ve been doing it in Europe for years: using ground nuts instead of flour. If you’re able to eat nuts, grinding them to the texture of breadcrumbs or powder is one of the easiest and best ways to simulate traditional flour in baking. I love ground almonds most, but almost any nut (or even seed) will do. Use raw nuts (keep the skins on for more fiber) and grind in a coffee grinder, spice grinder, or food processor (be sure you don’t overdo it, or you’ll end up with nut butter, though!). And don’t forget about coconut flour, which is available in most health food stores. 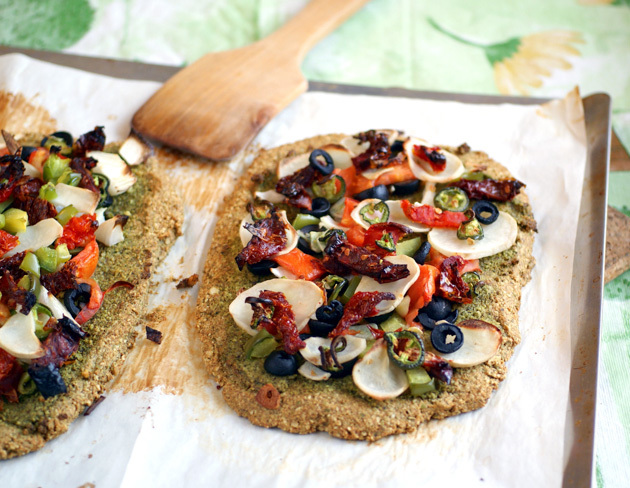 Beans and legumes make additional fantastic grain-free flours. Chickpea flour, garfava (a mix of chickpea and fava bean), lentil, pea, and many other varieties are now available; all add substance and binding power (as well as some extra protein) to your baking. 3. Get to the Root of it All. Many roots and other vegetables provide starches or flours, too. For instance, arrowroot, tapioca starch and potato starch can all help baked goods achieve a more tender crumb (texture). 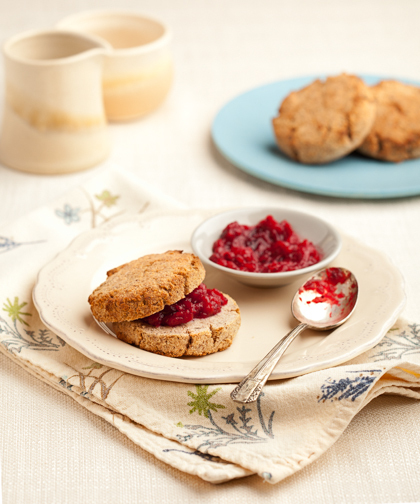 The best way to ensure grain-free success is to combine at least two categories of grain-free flours when baking. A combination will result in optimum texture to best recreate the baked goods you’re used to. I often use a mix of half to 2/3 nut or seed flour with about 1/3 bean or legume flour, and the final 1/4 to 1/3 from starch. Don’t forget your binder! Grain-free is naturally also gluten-free, so you’ll need to replace the gluten with another “glue.” Ground flax or chia seeds work nicely. And my latest favorite is psyllium seed husks, which resemble fine sawdust but are flavorless and work beautifully to bind my baking. Depending on the kind of baked good you’re making, you may wish to add some leaveners to help the dough rise. Nuts, seeds, and legumes are denser than regular wheat flour, so they need a little extra “lift” to produce a light and tender final product. 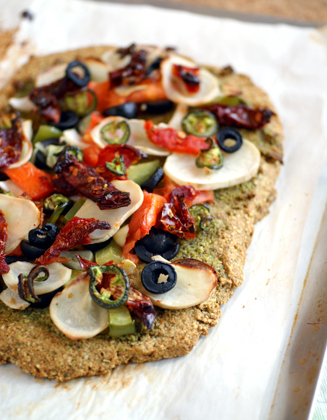 And if you’re looking for a great starter recipe, how about some pizza that everyone can enjoy? It's easy to make free-form crusts of any size with this base by simply spreading the dough out on parchment-lined cookie sheets. If you prefer one larger pizza, however, simply pat the crust into a large (14 inch or 35.5 cm) pie pan and bake an additional 10 minutes before adding your toppings. Preheat oven to 400F (200 C). Line a cookie sheet with parchment. In a food processor, process the almonds, coconut flour, potato starch, psyllium, chia, garlic salt, salt, basil and baking powder until it attains the texture of very fine cornmeal (or sand). Pour the broth and vinegar over the mixture in the processor and process again until you have a moist dough. Using wet hands, pat the dough on the cookie sheet to about ½ inch (1 cm) thickness. 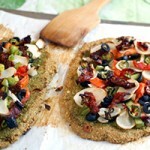 You can pat it in a large circle or rectangle, or make two smaller round or square pizzas, as you like. Bake the pizza(s) for 20-25 minutes (or bake a larger single pizza for 25-30 minutes), until the edges are beginning to brown and the top is dry. Add desired toppings and bake another 20-30 minutes until edges are deep brown and the bottom is golden (you can lift a little corner of the pizza to check). Be sure not to underbake, though, or the center of the crust will still be wet. Makes 4 large or 6 smaller servings. May be frozen. 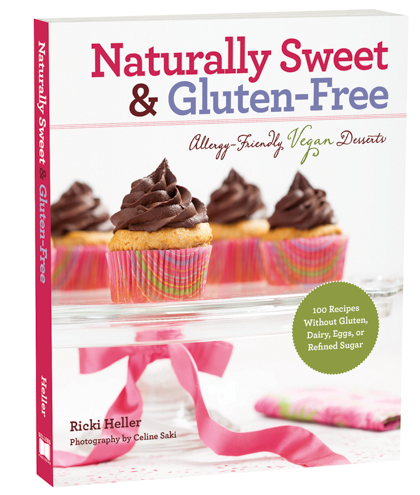 Ricki’s second cookbook, Naturally Sweet & Gluten Free, will be released in September, 2013. Her first book, Sweet Freedom, is one of only three cookbooks recommended by Ellen DeGeneres on her website. 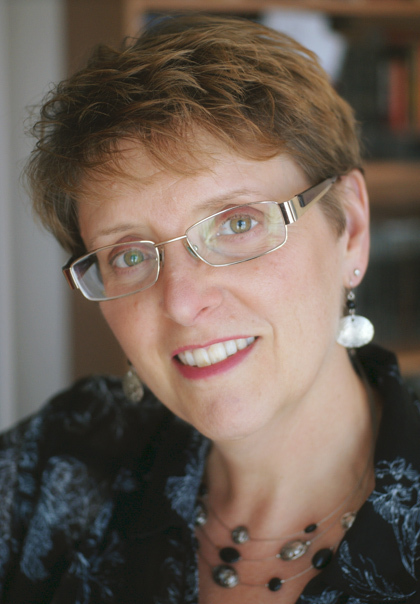 Ricki is also an Associate Editor for Simply Gluten-Free Magazine and has written for many other publications.